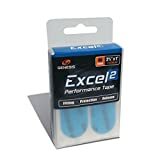 ExcelTM 2 has a release speed that is close to, if not slightly quicker than, bare skin. It has a smooth feel to its medium weave pattern, and is a step up in both thickness and texture from ExcelTM 1. If you are looking more for protection and fit from your tape, without a drastic change to your release speed, then blue is for you.